New artwork lines the walls of the first and second floors of Georgia Southern University’s College of Education (COE) classroom building. Each year, the COE Partnership Council invites regional P-12 schools to submit their top three pieces of student artwork. The College then spotlights these exceptional students and their art by framing and displaying the artwork in the building for a year. To signify the opening of the new exhibition of artwork, the College hosts Art Extravaganza as a “gallery” opening and recognition ceremony for featured artists and their supporters. On Sunday, February 5, friends and family gathered to recognize the over 40 artists whose artworks are now on display in the College of Education for the 13th annual Art Extravaganza. State School Superintendent Richard Woods was the guest speaker. Woods spoke of the importance of art, not only in education but for him personally as well. A high school educator for over 14 years, Woods said that when trying to decide what his career path would look like, he was torn between teaching either social studies or art. State School Superintendent Richard Woods (pictured right) and wife Lisha speak with Statesboro High School ninth grader and Art Extravaganza artist Victory Lee and her mother. Woods pointed out that during the recession, art programs in schools suffered and were often one of the first expenses to be cut. He, however, expressed the relevance for all students to be exposed to the fine arts in their P-12 education environment. Woods and Thomas Koballa, Ph.D., dean of the College of Education, were pictured with students after being presented with a certificate acknowledging their achievement. After the ceremony concluded, artists and their supporters were invited to enjoy refreshments and peruse the halls to view the new artwork. 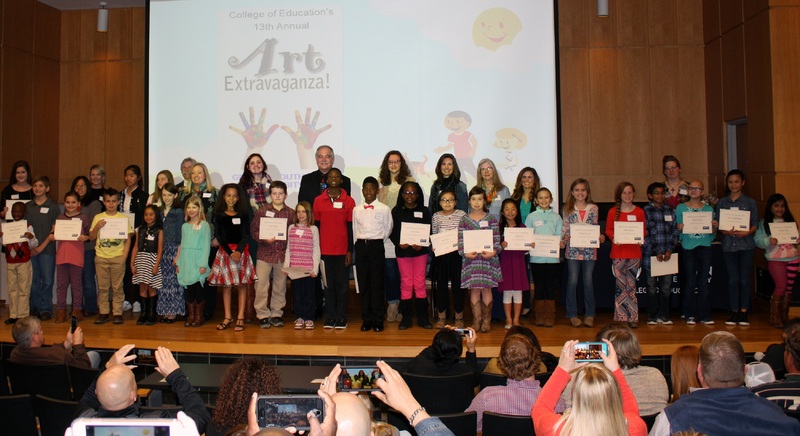 Contributing schools for the 2017-2018 Art Extravaganza include: Statesboro High School; Taylors Creek Elementary; Southeast Bulloch Middle; Julia P. Bryant Elementary; Brooklet Elementary; Stilson Elementary; Portal Elementary; Virginia L. Heard Elementary; Sallie Zetterower Elementary; Mill Creek Elementary; Lyman Hall Elementary; Bryan County Elementary; Blandford Elementary; Juliette Low Elementary; Effingham County High; Richmond Hill Middle; and Portal Middle High Schools. Art Extravaganza began in 2004 as an initiative to recognize student art and the work of certified art teachers, many of whom are Georgia Southern alumni. Each spring, a new exhibit opens and the artwork remains on display for a full year. The Art Extravaganza is sponsored by the College of Education’s Partnership Council headed by faculty member Christine Draper, Ph.D. The event is coordinated by Draper; Director of Field Experiences and Partnerships Pat Parsons; Administrative Specialist Lisa Wilson; and Administrative Assistant Janina Jones. Click here to view photos of the event!